Down N Outz, the Mott The Hoople-inspired side project of Def Leppard singer Joe Elliott, has issued a performance video of “Overnight Angels” as a preview to their forthcoming package, "The Further Live Adventures Of ..."
Due December 1, the project captures the group live at the Sheffield Corporation in December of 2014. December 1 will also see the band reissue its previous records, including their 2010 debut, "My Re-Generation", and 2014’s "The Further Adventures Of ..." on CD, LP and digital. Down N Outz – who primarily play Mott-related tunes (including songs by Mott, Ian Hunter and British Lions) – were formed specifically to open a series of 2009 reunion shows for Mott The Hoople at London’s Hammersmith Odeon. 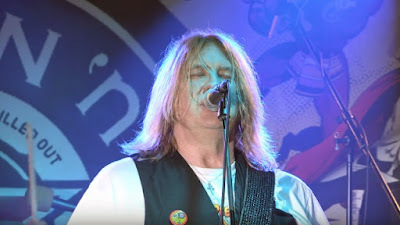 The group features Elliott, The Quireboys' Paul Guerin (guitar), Guy Griffin (guitar) and Keith Weir (keyboards), former Vixen bassist Share Ross, and drummer Phil Martini. Elliott and Def Leppard recently wrapped up their 2017 live schedule with a seris of three live dates in Mexico earlier this month. "The Further Live Adventures Of..."